Here’s something I haven’t received for many years: a QSL card. 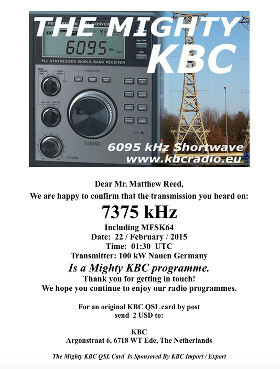 Technically, it’s an electronic QSL card (sometimes called an eQSL) from The Mighty KBC, a shortwave station located in Germany. The Mighty KBC broadcasts music programs up to two hours weekdays and seven hours weekends on 6095 kHz to Europe. But every weekend, The Mighty KBC also airs a two-hour broadcast aimed at Canada, the United States, and South America on 7375 kHz. “The Giant Jukebox” show, presented by Eric van Willegen, begins at 0000 UTC on Sunday, which is equivalent to 8:00PM EDT on Saturday. Not too bad a decode for a signal that travelled over 3500 miles. I sent in a reception report and received my QSL card by email. For two dollars, I could convert the eQSL card into a QSL card delivered by postal mail. According to the email I received from The Mighty KBC, I would receive a mention in the next week’s broadcast of “The Giant Jukebox.” Unfortunately, my recording of that week’s broadcast failed, so I never got a chance to hear it. I tried again the next week and here’s the image I decoded from “The Giant Jukebox” on March 2. It’s not quite as clear as my previous decode, but still a decent picture of a 1971 Mercury Marquis. Even though I have listened to shortwave radio for decades, I only ever received three QSL cards: Radio Netherlands, Deutsche Welle, and the BBC. Now I can make it four with The Mighty KBC. The Mighty Kbc looks interesting. Good to know there is still some decent stuff on shortwave. I’m going to listen this weekend and maybe get a Qsl of my own. After reading your articles about VOA Radiogram and now The Mighty KBC, I can see I must download the software and give image decoding a try. I use a 75 foot beverage so reception won’t be a problem. Do you use a special audio cable between the radio and computer? I am a longtime listener to the Giant Jukebox. I like the mix of music. The Mighty KBC is one of the strongest signals left on shortwave to the US. The signal comes booming in here on the east coast, good enough to pick it up on a portable. I use an ordinary (though rather long) audio patch cable. Ideally, I would use an audio isolator to shield the radio from computer noise, but I don’t detect much interference.